College Bound volunteer mentors undertake to "strengthen the student's math, language arts, and social skills while preparing them for the college journey." That's a pretty tall order. To support the math component of that responsibility, this webpage has links (below, left) to some math resources that I've created explicitly for College Bound. Please click those links and read those pages. It won't take long. 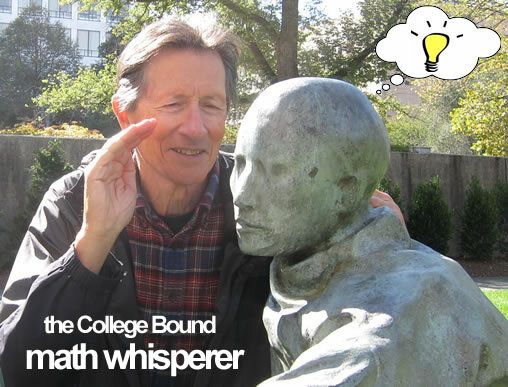 I'm henry@collegebound.org - Henry, in person - and I'm a volunteer like you. Don't hesitate to get in touch with me for anything having to do with math, especially as it relates to College Bound and improving any of the linked resources listed above. I've been teaching and tutoring math and its applications for decades (http://cs.gmu.edu/~henryh), but more relevantly I've been tutoring at College Bound since the spring of 2010. In 2014, Jim Price joined me at MathLab. He's a mechanical engineer (B.S. and M.S.) who knows his math and puts it to good use, both at work and at College Bound's Chavez site. In addition to being a mentor, he informally became the go-to guy at Chavez for the weekly math problems. In the fall of 2015, Marsh McJunkin is already at work in MathLab. In fact yesterday, Sept. 28, we had a successful evening for 7 students. Marsh has MS degrees in both math and computer science and has taught both of those subjects, working in high school and college.